Kaphwan Kim (김갑환) is a master of taekwondo, and also considers himself a fighter of justice. Since Kim was young and during his taekwondo training sessions, he was always reminded to fight for justice, and use the martial art as a way to accomplish this. Kim is considered as both a sport and national hero in his native Korea. This status is what enabled him to convince the authorities to give him custody over Chang Koehan and Choi Bounge to rehabilitate them out of their criminal ways. Although both men resented Kim for his actions, they have since grown to grudgingly respect him. In most of his King of Fighters appearances, he has been team captain of Team Korea. Kim strives for excellence and righteousness in everything he does, be it his fighting or personal life. He is a loving husband and father, and a strict disciplinarian. 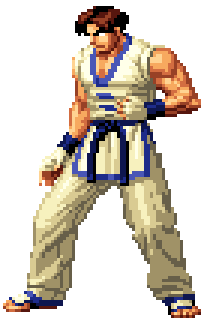 He is deeply respected and admired by his acquaintances for his honesty and bravery, and has many friends amongst the characters in both King of Fighters and Fatal Fury (chief amongst them being Fatal Fury's main protagonist, Terry Bogard). This page was last edited on 10 July 2009, at 03:04.